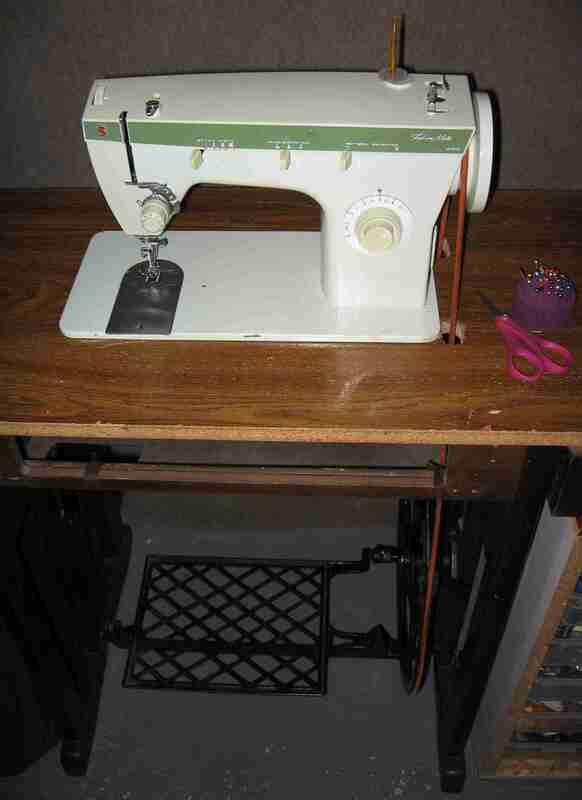 I learned to sew on my mother’s treadle sewing machine when I was about seven years old. I thought our neighbor’s electric zig-zag sewing machine was super cool, so as a teenager I saved up my babysitting earnings and bought myself an electric zig-zag machine. After sewing on this for a few years, I really started to miss sewing on a treadle sewing machine, but I didn’t want to give up that nifty zig-zag stitch, so I decided to try to make a zig-zag treadle sewing machine. I searched ebay* until I found a zig-zag sewing machine with a handwheel that stuck out over the edge of the sewing machine base. I found a Singer Fashion Mate 252 from the early 1970’s, in (not so) lovely shades of green. 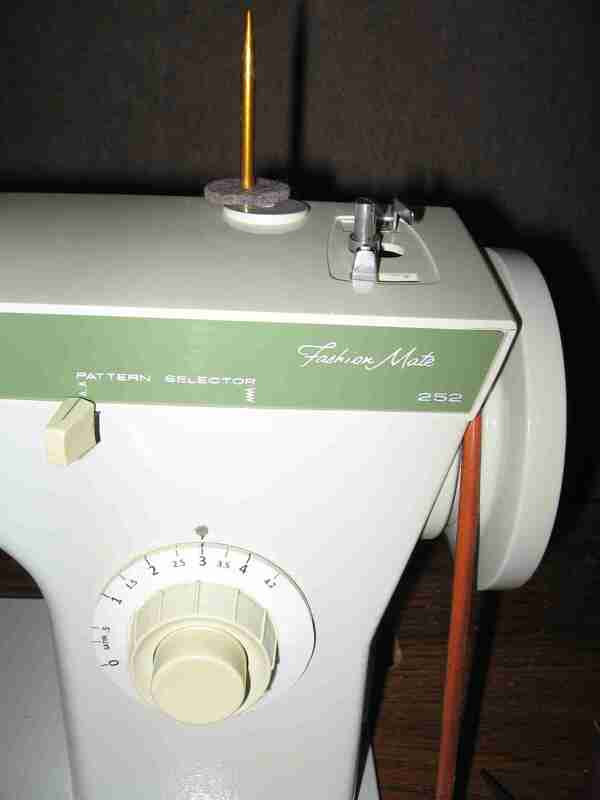 There are a few other Singer 200 and 300 series zig-zag models that also can be used with a treadle. Janome now makes a modern sewing machine to be put in a treadle base, too. I didn’t have a cabinet the sewing machine would fit in, but apparently they fit right into a Singer 66 cabinet. I cut out a hole in a scavenged particleboard desk top and attached it to a treadle base I bought at a garage sale. I keep meaning to replace that particleboard with something prettier, but it works just fine, and I’m more into function than form, so it’s never made it to the top of my priority list. This sewing machine is harder to treadle than a straight stitch machine, but my back gets tired from bending over the sewing machine before my legs get tired, so its not really an issue unless I’m doing a lot of satin stitching. I like how universal the older Singer short shank machines are – I can use all of my vintage Singer attachments as well as modern attachments for short shank sewing machines. The Fashion Mate 252 comes with straight stitch, zig-zag, and a blind hem stitch. 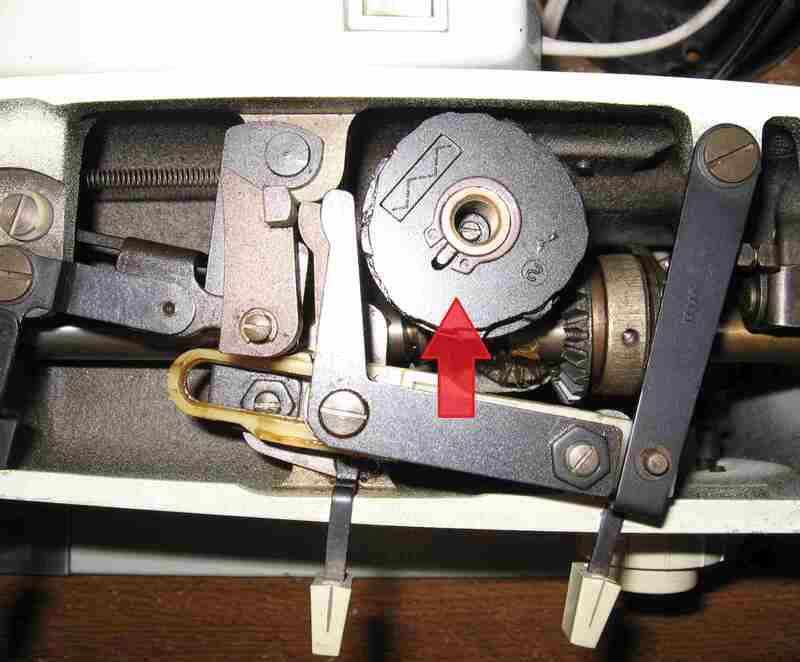 In m y many hours spent looking at sewing machines on ebay, I’d noticed some flat black special stitch cams that looked like the ones inside my sewing machine. I took a chance and bought them, and luckily they fit, so I replaced the blind hem stitch cam with the 3-step zig-zag cam. You can also sew a blind hem with the 3-step zig-zag, so I’m not losing that function. Usually stitch lengths are measured in millimeters these days, not stitches per inch as this sewing machine is marked with. I got tired of making the conversions, so I made a new label for the stitch lengths. The thread holder is a section of a knitting needle that I glued in place with a huge glob of hot melt glue underneath, since the original thread holder had broken off. I re-wired the light directly to a cord and re-attached it on the back of the sewing machine. When I’ve told people about this sewing machine, they’ve commented that I could sew when the power is out. Which seemed kind of silly, since I’m not usually thinking about sewing when the power is out. I’m usually thinking about how I can keep the food from spoiling, and where the heck did I leave the flashlight. But we lost power several times this summer due to thunderstorms, and one of those times I noticed an article of clothing that needed mending sitting on my sewing machine and I took care of it, just for the novelty of sewing when the power was off. I have been sewing with this sewing machine for years, and I love it. I have an electric sewing machine that’s only a few years old, but I hardly ever use it. *I don’t recommend buying sewing machines on ebay. I bought three, and they all arrived damaged. Fortunately I was buying two of them for parts, and most of the parts were still good. Most people don’t know how to package sewing machines for shipping. Always good to make do with existing materials (particle board treadle top, knitting needle spool pin), and kind of a pleasant coincidence since I cut a hole in the top of an old desk for my wife’s first sewing machine, a Wards 3/4-sized Signature 266 back around 1977, and used knitting needle pieces (same color even) to replace the spool pins on her first Singer 401A later in 2006. My wife is also much more into function than decoration, so the knitting needles are still in use on that machine today. She won’t let me change them. My first treadle zigzag in 2013 was a Singer 306W24, in a treadle stand assembled using the top out of a model 56 electric cabinet mounted on a tubular steel-legged Singer treadle. Why don’t try to find a 237 fashion mate with zig zag? It has all metal gears, external motor, and no timing belt. I saw Singer 237’s recommended so often for treadling, I got a couple to try, since they are common and inexpensive. I don’t like them at all. For one thing, for an “all-metal” machine, they have a lot of 1970’s plastic on them that is at the end of it’s lifespan. Both of the 237’s I got needed new tension sprockets and race covers. The main reason I don’t like the 237’s is that they won’t sew stretchy fabric AT ALL. They skip 9 stitches out of 10 on stretchy knit fabrics or elastic. You can’t even use them to sew the ends of a piece of elastic together. I haven’t gotten a service manual for these machines to see if the problem with skipped stitches on knits can be improved by adjusting something, but both of my machines have the same problem, which leads me to believe it is likely a design issue, not just a poorly adjusted machine. Another thing I don’t like is that they don’t sew a true straight stitch. The zig-zag forming mechanism is always in motion, which makes these machines just as hard to treadle when you are sewing straight stitches as when you are zig-zagging. And finally, I use the 3-step zig-zag stitch really often, and some other utility stitches occasionally, so a machine that does straight stitch and zig-zag only just doesn’t work for me. I was using my Singer 328K that I set up to treadle, but now that I have a Singer 411G I prefer to use that machine. The 411G actually does a pretty decent job of sewing knit fabrics, which is hard to find in a vintage machine. I really enjoy your blog and sharing your thoughts on treadle machines.I really don’t sew myself but looking for machines that the Amish in this area can use. Some have gone to the Janome 712T and I also wonder how long they will hold up. The reason I asked about the 237 was I replaced modified spoked balance wheels on two 237’s think the larger wheels would be easier to grab and also provide more momentum. Only one is being used by an Amish women and I haven’t seen her to ask how it is working. I will have to visit her and see what she thinks. Have you ever tried a 306 or known anyone who has. I also think I saw in a manuel that a model of the 401 was made for treadle. Well I will keep looking for a 328K and a 411G. Thanks for all your experience. The 237 would be OK for someone who doesn’t need to sew stretchy fabrics. I don’t know if the Amish sew anything with elastic or spandex in it. I’d replace the parts I mentioned even if they aren’t broken yet, because the plastic is brittle and those parts will break soon even if they haven’t yet. Just look for machines that do not have yellowed plastic, since the plastic cover and knobs will not be as brittle. I think sunlight causes the yellowing. In my eternal search for the perfect treadle-able zig-zag sewing machine, I’ve tried quite a few different machines, but I did not try the 306. I don’t like that it takes a non-standard needle. Overall, I’ve not been impressed with Singer’s early zig-zag machines. The 411G is the only Singer brand treadle-able zig-zag machine I’m happy enough with to use regularly, but they are expensive and hard to find in the US. My 411G does take some effort to treadle, so I use a straight stitch machine when I’m doing a lot of straight stitching. I’ve also discovered that the flat urethane belt I’m using to treadle my electric-version 411G slips when I try to use the 411G to topstitch thick denim. There are a lot of all-metal zig-zag machines made in Japan by various companies in the 1960’s that are easy to put in a treadle table. These machines generally are well made. These will probably be the best solution for most people needing a sturdy zig-zag machine to treadle. I have an Emdeko that is the smoothest running machine I have, it’s all-metal and will sew through anything I can fit under the presser foot, and it’s easy to treadle even when zig-zagging. I just need more stitch options than I have on that machine and it skips a few stitches on knit fabrics (nowhere near as bad as the Singer 237, though!). 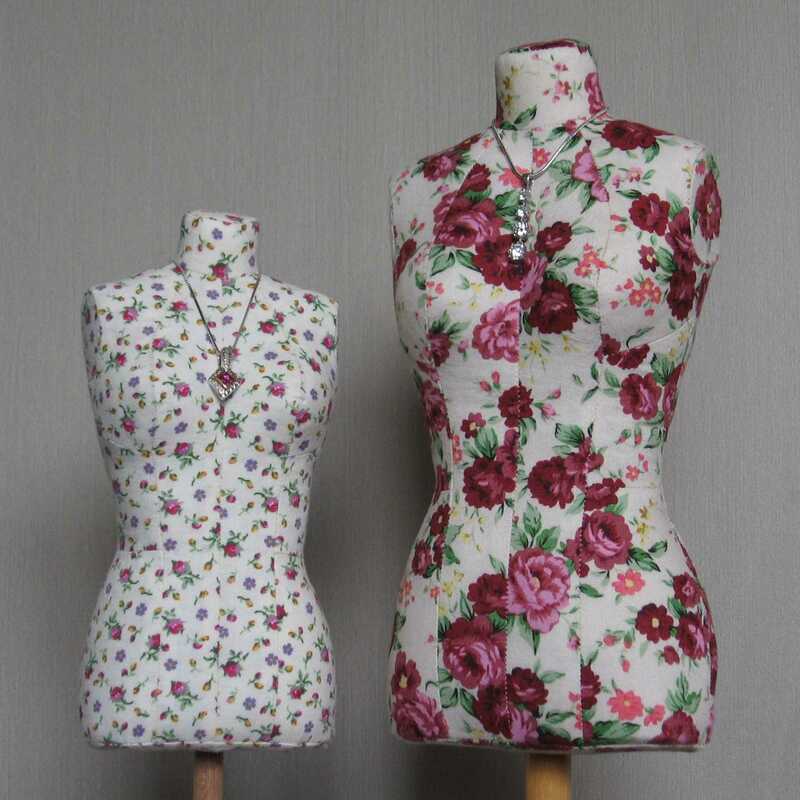 It’s kind of hit or miss with how well vintage machines sew stretchy fabrics – by the time most sewing machines were designed to sew knits well, they typically were made with lots of plastic and had internal motors. Since I sew just about every type of fabric, I need at least three machines to keep me happy – a straight stitch machine for quilting and general straight stitch sewing, the Janome 712T for knit fabrics and special stitches, and an all-metal zig-zag machine for any time I need to zig-zag on heavy weight fabric.